A la Vodka sauces are fantastic and this one is very easy to make at home, so don’t wait to order at a restaurant treat yourself at home! I highly recommend the ricotta salata cheese, because the saltiness complements the creaminess of the dish. 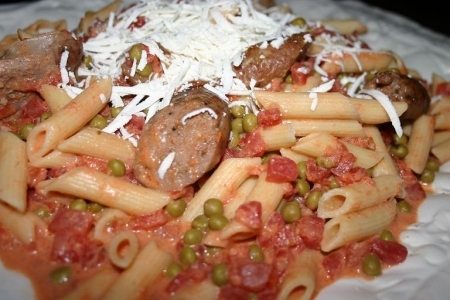 The sauce is so wonderful and versatile try making a pizza – Sausage Pizza a la Vodka Style. Place sausage on a cookie sheet, cover with foil and bake in preheated oven at 375 degrees for 30 minutes. In a large deep skillet over medium high heat, add vodka. Stir often and reduce by half, add tomatoes and Boursin cheese. Stir until cheese melts. Lower heat and let simmer for 20 minutes. Cook penne pasta per package directions, drain and set aside. Once sausage is cooked, remove from oven and slice on a diagonal in large pieces. Add sausage and peas to sauce. Stir. Pour pasta into large family style serving dish, top with sauce. Serve with ricotta salata cheese. Try Beringer Founder’s Estate Old Vine Zinfandel (California), Bogle Vineyards Old Vine Zinfandel (California) or Rosemount Shiraz (Australia).